My first attempt at Decoupage ! Bookmarks are very handy and warmly received by anyone whose reads books . Nowadays I am deeply into papercraft .While trying to locate various kinds of paper supplies I came across a gift wrapping paper which I had got from Archies a few years back. The lovely rose pattern on it gave me ideas ! 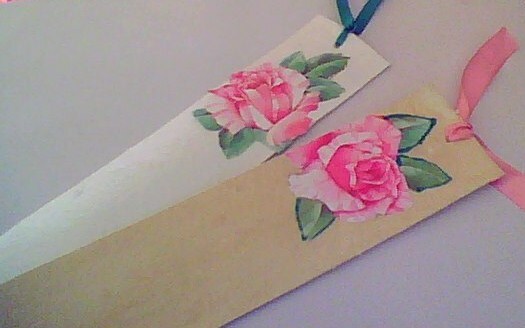 I snipped out a couple of roses and leaves carefully and stuck them with fevicol on a bookmark (6"x 1 1/2"). Then I made a tiny hole and put in a ribbon .My bookmark was ready !